Success (at last, and none of my doing) with the oriental poppy. I'd become resigned to thinking of the perennial poppy as a flower that I could admire only from afar, in someone else's gardens. About three seasons back, I'd bought and planted a few potted ones, in their late summer dormancy, and they didn't care to stay. What happened? During the period in which the poppy is getting itself entrenched the gardener will be sorely tempted to stick in a few other things—a peony here, a redwood there—since the poppy is not occupying as much room as the gardener thought. No. And it never will, either, if we start plopping in other plants over it. Then, two springs ago, I scattered the contents of a couple of seed packets in the eastern annual bed—a small rectangular strip of unredeemable soil, bounded by concrete foundation on two sides and by concrete patio on a third. These were oriental poppy seeds, bought in my earliest gardening days before I learned to become intimidated at the prospect of attempting perennials from scratch. These seeds were old, and were being weeded out (so to speak) in one of my all too infrequent de-cluttering sprees...so I figured they could just as well be thrown out into the garden as thrown out. 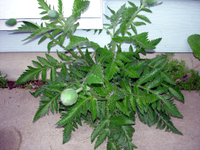 Early this spring, foliage from this plant (and from a second plant, in the garden bed proper) emerged, large and alien. Having had no real-life, up-close experience with a healthy oriental poppy, I almost thought these were weeds...a cross between a dandelion and thistle. But some instinct stopped me from pulling them. Then, a few weeks later, in a visit to Allen Centennial Gardens, I came upon the same foliage, with the plant tag Papaver orientalis. The poppy pictured will have salmon-colored (if I remember the seed packet correctly) blooms, as frilly and delicate as an antebellum debutante. Henry Mitchell advises that an oriental poppy requires a bushel basket (a "thirty-inch circle," to be precise) of space to thrive. But given that this plant has somehow made it in the space of a three-centimeter crack—a veritable botanical snail darter—I think we'll need to reroute our plans to install new steps on this side of the patio. I had them at our last house, a bequest of the previous owner. Now I am back to a pack of sees myself. The first time I came across Oriental poppy foliage, I thought it was a weed, too. But I don't know if I'd re-route the steps for a plant--but I might postpone the steps long enough to get seeds from the poppy, to replant someplace else. You're supposed to be able to move them when they go dormant, but good luck getting the root out of a crack like that. But don't you love how plants can surprise you? Hehe... Isn't it funny how plants will defy our efforts to grow them and then just pop up where ever they please? Henry Mitchell was one of God's greatest gifts to the gardening world, right up there with any yellow rose underplanted with linum perenne, but... but on the point of oriental poppies requiring so much space to thrive, I think differently. My theory is that where Mitchell gardened is so damn humid that his poppies, not preferring hot and dry as much as requiring it, would have needed that much extra air space just to avoid suffocation. Just IMHO, of course: YMMV and all other caveats. I think you’re garden must have a cunning plan ... it obviously didn’t want new steps in the same place as you ..
Good heavens -- I can't get rid of mine. I've dug the bed out twice, removing soil to a depth of two feet, and STILL they come back. Very resilient plants they are -- in my garden, at least!